Posted by Grace Sue on 11/28/2018 5:15:48 PM. If you want to jailbreak your Kindle devices, you must downgrade Kindle firmware firstly. In this post, you will find it's very easy to downgrade Kindle Paperwhite or other Kindle versions. You do not have to check other places. Here you will get all things about downgrading your Kindle devices. Please back up the "documents" data in your Kindle before you start to downgrade. Want to jailbreak your Kindle? Try this method to jailbreak your Kindle. Note: Before downgrade your Kindle devices with below firmware, you must check whether your KSN suited with the specific firmware. Skip here to Confirm your Kindle Model. And your KSN must be in Table 1 before you install the specific firmware. If you install the wrong firmware, your Kindle device may turn into a brick. Following .bin files are prepared for you to downgrade your Kindle firmware. With the specific firmware includes Kindle Paperwhite firmware, you can downgrade your Kindle easily. These downgraded firmware files can recover your Kindle to the factory default firmware version. Please mention that the size of Kindle downgrade firmware is bigger than usual firmware files. Your Kindle device must have enough space for these downgraded firmware files. And so far Kindle firmware 5.8.8 can't be downgraded. The number in the .bin file represents the Kindle version. Even though the current version of your Kindle device matches the version of the downgraded firmware, you must download and install the specific .bin file to prepare to downgrade and jailbreak. Please be sure the MD5 code suited with the downloaded .bin files. 1. Turn on the airplane mode and keep your Kindle off-line. 2. Keep full power of your Kindle. 3. Remove your Kindle device passcode and turn off parental control. 4. Collect your Kindle to a computer with a USB cable. 5. When the Kindle disk displays, you can copy the downloaded .bin firmware file to the Kindle root directory (at the same level with the documents folder). 6. Eject your Kindle from the computer. 7. Come back to the home screen of your Kindle device. Tap setting icon and choose the device option. Then tap "Update your Kindle". 8. The degradation will take some time. Be patient. 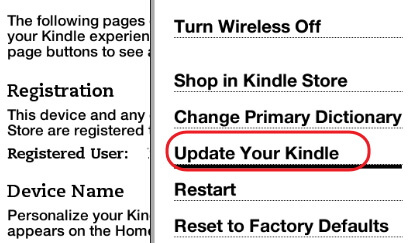 It's important for you to check your Kindle model if you want to downgrade your Kindle device. And your KSN must be in Table 1 before you install the specific firmware. Also if you want to jailbreak your Kindle devices, you can check them to decide which methods you can try. Table 1: Kindle devices with below KSN can be downgraded and jailbroken with this method. Table 2: Kindle devices with below KSN can be jailbroken with this method. Table 3: Kindle devices with below KSN can't be jailbroken so far. Once there is a new method, I will update it immediately. Most of the time, KPW3 can be downgraded well according to above methods. But once in a while the Kindle Paperwhite 3 may turn in wrong conditions such as stuck at the start interface or loop restarting. Don't be panic. You will get rid of this trouble. When the KPW3 was in a wrong condition, you must plug it in a computer and decide which methods you could try. How to fix: Copy the downloaded .bin firmware file to the Kindle root directory. Then eject your KPW3 device from the computer and remove the USB cable. Long press the Kindle power button 40 seconds to reboot. How to fix: Create a new empty folder named DO_FACTORY_RESTORE without a suffix name. Then long press the Kindle power button 40 seconds to reboot. At that moment the Kindle disk appears, you must copy this created folder to the Kindle root directory. Then reboot the Kindle device again. After that, you can copy the downloaded .bin file to the Kindle root directory. Eject your Kindle from the computer and reboot again. There is no need to worry about Kindle Paperwhite downgrade. With these specific Kindle firmware, you can downgrade and jailbreak your Kindle devices with no limitation. Look forward to hearing your good news! I have a Kindle Voyage, 5.8.8 serial number starts with 9013. Whenever I download the update_KV file to my kindle and safely remove the device from my computer the option to update my Kindle is greyed out and the update_KV file has been removed from my Kindle. Any help would be appreciated. I have tried everything I can think of up to and including resetting the device. For now, Kindle firmware 5.8.8 can not be downgraded. If there is a new way to jailbreak Kindle 5.8.8, we will update immediately. If we find there is a way to downgrade Kindle firemware 5.8.11, we will update this article. Unfortunatelly, I have upgraded my Kindle Paperwhite 3 to version 5.8.9.2. Is there any chance to do a downgrade, or will be? The problem is that my Kindle automatically deletes the downgrade file. Yes, for the newest firmware version 5.8.9, you cannot downgrade for now. Sorry for that, but if there is any method, I will post it. I have a PW3 with a Firmware V. 5.8.9 and a SN: G090 G1. I believe there will be a solution in the near future, but not now. Have KOA with 5.8.9.2 firmware. cannot downgrade ?????? As far as I know, there is no way to jailbreak Kindle Firmware 5.8.8 and higher. If there will be any solution in the future, I will update immediately. hi I just tried the Jailbreak with new Kindle PW3 installed the File as you said in your post and now it hangs up at the starting screen with the tree. What can i do now? The downgrading process will take a while. Please it more time and wait patiently. If the it frozen for 2 more hours, please read the Tip2 about downgrading the Kindle paperwhite3. Did you solve this issue? I'm hoping I haven't just bricked my brand new pw3! Alright... also at the dreaded 5.8.9.2 firmware on Kindle PW2. Will patiently wait for any new method. Thank you so much Grace for distributing this knowledge!!! The problem is that my Kindle automatically deletes the downgrade file. Sorry to inform you that Kindle firmware 5.8.8 can not be downgraded for now. If there is a new way to jailbreak Kindle 5.8.8, we will update immediately. first thanks for the great tutorial! I have a Paperwhite3 with firmware 5.8.10 but when I'm trying to downgrade the "kindle update" is greyed out. @juul...."I'm trying to downgrade the "kindle update" is greyed out." ...I have the same problem with my PW2 5.8.11!? ...."I'm trying to downgrade the "kindle update" is greyed out." For now, there is no way to degrade the Kindle firmware5.8.11. If there is, we will post it here ASAP. i have tried to downgrade my kindle pw3 5.8.10 fw and now it stucks on screen "our kindle needs to be repaired" and it still reboots and disconnect from pc. is there any way to repair it? I have same problem here, the PC still can recognize the Kindle as USB Disk, however, it restart endlessly so I don't have enough time to copy over the firmware .bin to Kindle for recovery (copy ~18% then Kindle restart and disconnected from PC). 40 seconds long press reboot doesn't work...every time Kindle reboot, it tried to grab the incomplete .bin file and perform upgrade and resulted in UPDATE ERROR 4...we don't have enough time to copy the .bin image over Kindle for recovery. Did you find a solution please ?? I have exactly the same.. I have a "B0C6, 90C6 Kindle Basic (2014) KT2, BASIC" device. I copied the "update_KT2_5.6.0_initial.bin" file into the root directory. Update ... remained gray. In fact, the .bin file has been deleted! My K2 device firmware 5.8.11. As far as I known, firmware that newer than 5.8.9 is not allowed to downgrade. This means if your Kindle firmware was newer than 5.8.9, you can't downgrade the software unless jailbreak the Kindle device! Hi, I am from India. Using Kindle 8th Gen device. How to degrade that. The model is not mentioned in the table.